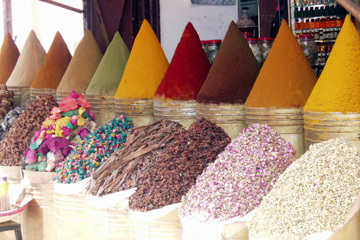 Herbs and spices for sale are piled into colorful cones at a Moroccan market in Marrakech. When I learned of an opportunity to visit Morocco, images popped into my head of crowded, dusty cities full of ancient buildings with intricate tile work, marketplaces selling colorful carpets and mounds of exotic spices, an expansive desert with drifting sand, people decked out in long biblical robes riding camels and donkeys - images probably rooted in the National Geographic magazines I pored over as a kid. » Touijri Cars, 110 euros per day. Call 044-4297-45. We arrived in Marrakech in the late evening, somewhat jet-lagged, ready for an adventure. Our stay was to be short in Morocco and, not wanting to rely on public transportation, we arranged for a car rental prior to our arrival- actually, not a car but a four-wheel drive - as we wanted to have the option of seeing the country off the beaten path. 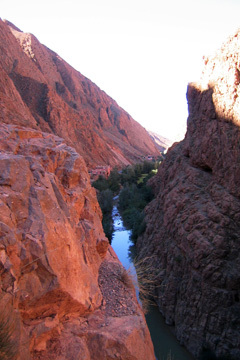 Our plan, purposely vague so that we could have the freedom to fine-tune our itinerary daily, was to head toward the Dades Gorge, have a look at the Atlas Mountains, take a quick trip to the Western Sahara and drive up the Atlantic coast back to Marrakech. The following morning, armed with our Michelin map, and a full tank of diesel, we set out to explore. The roads were excellent and traffic was light or, in most cases, nonexistent. We made our way west toward the Dades Gorge, following a winding river that snaked past small tidy farms and terra cotta-colored ruins that looked as if they had sprouted from the earth. As we made our way up the canyon, the cliffs became sheerer; the shadows of the afternoon sun made the river below disappear. It was breathtaking, partially from the spectacular view, but also from the lack of guardrails. We spent the night in a riad, a traditional Moroccan house distinguished from others by its interior garden. A brisk swim in the spring-fed pool, followed by a short nap in the afternoon sun, and we were ready for dinner. The dining room had a low ceiling made of pisé, mud and straw, very much like adobe. The chairs were hand hewn and roughly made, but sturdy. I imagined that the same sort of buildings and furniture had been used for centuries. The damask tablecloths and delicious cooking smells brought me back to the present. We were served a hearty French dinner of lamb and vegetables, all of which were grown in the riad garden. A riad, or traditional Moroccan house with an interior garden, is perched on a cliff at Dades Gorge. The next morning, refreshed, and amused by a box of Kellogg's cereal (Cheerios written in Arabic) we planned our route over the Atlas Mountains. The dotted line -- signifying unsurfaced roads and mule tracks -- that zigzagged across our map looked interesting. After all, we were in a four-wheel drive, why not venture where most tourists don't for a glimpse of the real Morocco? The reddish clay color of the Dades Gorge faded from red to brown as we neared the turn to an unpaved road. In the distance were colossal mountains, each one followed by another, all seemingly void of plant life other than prickly shrubs and an occasional small tree. According to our trusty Lonely Planet Guide, the mountains were created by the prolonged collision of the African and Eurasian tectonic plates some 80 million years ago, the result of which formed tall peaks, some 13,200 feet high. We shifted our SUV into four-wheel drive, and with our map and guidebook in hand, several bottles of water and a giant Cadbury bar for sustenance, we drove on. About three hours into our adventure of continually climbing dusty switchbacks and negotiating rocks, and shortly after our international cell phone, guaranteed to work anywhere, beeped "no service," we became suddenly aware that we could no longer judge where the road started nor see any end in sight. Stopping briefly atop a mountain to have a look at the map, I noted that there were scraggly peaks for as far as I could see. It was a strange feeling, prompted not so much by fear as the dire sense of being insignificant, just a small speck in the middle of nowhere. Although we didn't voice our concern, the thought that we might be lost crossed our minds. "Shouldn't this road be taking us north?" I ventured, trying to sound calm. We hadn't come across any intersections -- so we couldn't ponder the road not taken -- or had we? For a short time the road seemed to have disappeared. Could we be going in the wrong direction? Our map showed a slew of roads that seemed to gradually fade into walking paths. Our attention to our whereabouts was forgotten when we came upon a family of Berber nomads riding on camels and donkeys with a small herd of sheep. On one camel were strapped five small children, all swaddled in bright colorful bits of carpet. The people who inhabit the Atlas Mountains are the Berbers (creators of the Berber carpets), and, according to our guidebook, also are noted for their fierce resistance against invaders. An hour or so later, our dirt road getting rougher and narrower by the mile, we wound down to an oasis-like area, lush with date palms, small vegetable gardens and more reddish brown pisé huts. People -- at this point a welcome sight for us -- seemed curious about our presence and ran toward our car to get a glimpse of us as we passed. We climbed another mountain before the dirt road again widened, straightened and became less bumpy. After encountering two trucks, the only vehicles we had seen in hours, we spotted a marker indicating we were still on the right road. Breathing a sigh of relief, we celebrated with a generous hunk of chocolate. AFTER SEVEN HOURS of four-wheel driving, though we were truly pleased by the experience, we became almost giddy with jubilation when our dirt road intersected with a paved road sporting a sign reading "N'Kob" with an arrow pointing north. Feeling as though we had completed the Baja 500, we coasted into the village of N'Kob and found Ksar Jenna, our riad for the night. Admiring the fine carpets, we learned from our proprietor, Youssef, that if we were interested, all of the carpets in the riad were for sale. Furthermore, if we didn't find what we were looking for, we could visit his family's home and have a look at their carpets as well. Dinner was traditional Moroccan fare: a mouth-watering tangine of chicken cooked slowly with dates, honey, almonds and tangy green olives. Mint tea was served in a candlelit rose garden on plush Berber rugs, a relaxing and perfect end to an adventurous trek over the Atlas Mountains. The next morning during breakfast, Youssef told us that our rental sported the black-and-white license plates reserved for the Moroccan Royal Family. We're not sure why we had them, but they could be why we seemed to be of special interest while driving through small villages. 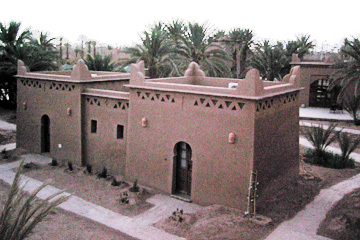 Dar Azawad, a riad in the Western Sahara, comprises Kasbah bungalows and Berber-style tents. After bargaining for and purchasing a Berber carpet (the price of which included two T-shirts from Hawaii) we hopped back into our SUV, and headed east toward the Western Sahara, billed as the largest desert in the world. According to our guidebook, a massive prehistoric climate change caused the whole place to dry up. Wind and erosion then turned the petrified land into sand, some 3,000 miles of it. There isn't really an edge of the desert; you encounter it gradually. The closer we got to it, the drier and sparser the environment became. The colors of the earth changed from brown to the terra cotta we encountered at the Dades Gorge, and then changed again into a soft chalky pink. The dirt became finer and more sandlike, and the small scrub brush less frequent. The horizon shimmered in the heat, and began to look like glassy pools of liquid. As we approached these illusory pools they disappeared and were replaced by more in the distance. It is easy to imagine how these mirages fooled hot and delirious travelers in times past. The heat was soupy, and the road flat and straight. Even though we were zipping along at 80 m.p.h., we felt as if we were barely moving. The experience was similar to the one we had for a fleeting moment in the Atlas Mountains, of being in the middle of nowhere, humbled by the vastness of our immense surroundings. We drove on, a plume of fine sand kicked up by our tires billowing behind us as we sped further into the Sahara. Dar Azawad, our riad for the night, was described in our guidebook as the last place to stay before the pavement ends and the depths of the Sahara begin. There are camels for hire there for day jaunts into the desert or for longer treks. We briefly contemplated a camel excursion but decided against it, as we wanted to get an early start the following morning. Similar to the other riads where we stayed, this one was also pisé, surrounded by a wall to keep the drifting sands out. Despite this wall, fine sand was everywhere. During dinner, we marveled at the appearance of the other guests. They looked so crisp, their clothes pressed and proper in the midst of salmon pink sand, as if on a movie set. The evening brought silhouettes of the date palms, donkeys and an occasional camel and sand dunes everywhere. It was a scene out of "Lawrence of Arabia," and with nightfall and the absence of electric lights, the stars shone especially bright. ON DAY FOUR, our agenda was to head northwest, not to see spectacular terrain or go off-roading, but to stay at the legendary La Gazelle D'Or in Taroudant. Described as an "oasis of tranquility," the luxury hotel comprises 30 intricately decorated stone cottages, each with a private terrace thick with climbing bougainvillea. After checking in, we arranged to visit the hotel's hammam (traditional Moroccan steam room), and, after debating the attributes of aromatherapy, enjoyed a frankincense oil massage. Dinner, with much of the food grown organically in the hotel's gardens, was served in a formal setting (jackets required), and was excellent. In fact, I would rank my main course of pheasant and couscous as superb, definitely one of the best meals I've had. A smartly dressed man played Chopin on an ancient piano during dinner, and following dessert, we enjoyed gin and cucumber drinks on the terrace. Although La Gazelle D'Or featured all the amenities one would expect at a five-star hotel, it also featured some quirky touches. Most memorable were the horses grazing leisurely on the croquet field, the elderly Labrador retriever that graciously visited our cottage, and my favorite, the pair of exquisite dueling pistols we discovered in the library, which I can only imagine were made available for the settling of guest disputes. After lounging in the splendor of hotel until check-out time, we headed toward the coast and up to Essaouira, a walled city on the Atlantic, popular for both wind and kite surfing. The coastline terrain was similar to that of the San Luis Obispo area of California, minus the population. The town, full of whitewashed buildings with blue trim, was a great for walking. No cars were allowed because the streets are too narrow, but stands and markets bustled with activity as knives were sharpened on ancient stone wheels, fragrant baskets of herbs and mounds of colorful spices lured passersby, and hand-woven blankets and an array of leather goods were sold. It was straight out of the National Geographic article I had read as a kid, only richer. People in native dress haggled with vendors, while children ran and played, and stooped men pulled rickety carts heaped full of vegetables. We wandered through stands of carefully stacked pyramids of figs, dates and dried apricots, stalls of freshly butchered fowl and goat hanging above well-fed dogs napping in the shade. There were also overflowing buckets of olives and numerous small shops selling functional Moroccan pottery, unusual shoes and traditional clothing, plus large baskets of fresh fish, clams and snails, with rough-looking cats stalking their territories. Essaouira was the hangout place for Jimi Hendrix, and there still seems to be a certain bohemian draw. While the town's ambience was still very Moroccan, it was the first time in our travels that we encountered a significant number of tourists. Most we encountered seemed relaxed European surfers or travelers content with camping out in their vans near the beach. The next day, we left Essaouira and began the relatively short drive back to our starting point of Marrakech, where we were to spend three additional days (that's a whole other story). Not wanting to actually drive into the dense heart of Marrakech, we called our car rental agent, who agreed to meet us on the city's outskirts. The car exchange went without hitch as she glanced at our dust-covered car, we gave her the keys and off she went. In hindsight we realize we were quite naïve in terms of our preparedness for the four-wheel drive portion of our adventure. In considering any off-road travel in Morocco, I would strongly suggest checking to make sure a jack, wrench and spare are included in the vehicle (we didn't) and to bring extra water. Also, confirm that your cellular phone will work and let someone know where you're headed and when you expect to return. I originally figured that this would be the one and only time I would visit Morocco, because there are so many other countries on my list to explore. I'm having second thoughts about that now, imagining the Atlas Mountains in the spring, blanketed with wild flowers, and another savory meal at La Gazelle D'Or. We do not have permission from the freelance photographer (Jeff Kennedy) to publish his/her photos on StarBulletin.com. We require a signed NY Times vs. Tasini Permission Form on file in our offices before we can release the photo(s) for public consumption online. If you are the photographer of the photo(s) and desire it to be available, please download, fill in and submit the form, then contact webmasters@starbulletin.com to make arrangements to get the photo(s) published. We regret any inconvenience to our readers. Jefferson Finney is the director of the Honolulu Star-Bulletin's Newspapers in Education program.